Benghazi scandal: Hillary Clinton is polling better than in February. 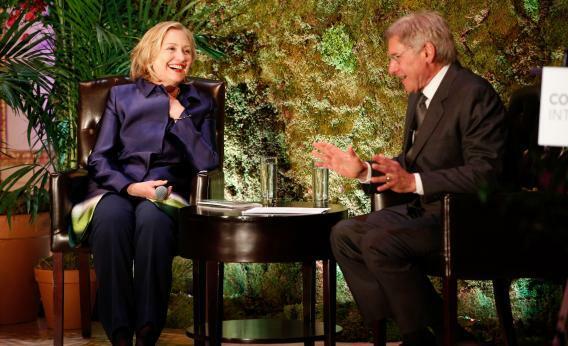 Hillary Clinton and Harrison Ford attend the 16th annual Conservation International dinner at The Plaza Hotel on May 15, 2013 in New York City. Public Policy Polling has come out with some of the more trollish-yet-useful polls of the 2016 race. (By definition, any 2016 poll conducted in 2013 is trollish.) Because they always put a ballot test in the questionnaire, PPP’s robots get a pretty lean, accurate measure of what people think of the candidates as candidates, not as famous people. So. In February, they found this rating for Hillary Clinton, much softer than her usual +30 point favorable rating. * Republicans typically cut off the Clinton answer to make it sound like she was wholly callous about the deaths of Americans in Benghazi. Her full answer, of course, was that “four Americans are dead,” and “what difference does it make” whether that came after a protest or a planned attack. Still bad!